In a recent focus on social media and political upheaval, I needed an interpersonal communication activity that related to the issues. I needed to present students with relevant authentic material to spur conversation. I needed a way to monitor what they were doing. I wanted it all to apply to the focus. And so, TweetFest was born. I didn’t use a Spanish name for the activity on purpose because I want you to be able to use it regardless of the language you teach. 1. Locate relevant tweets by searching Twitter. Write the person’s Twitter user name and their tweet in the top box. On Twitter you can search for a vocabulary word or phrase from your current focus, or you can browse trending topics in various areas. For example, today one of the trending topics in Venezuela is #EnLosBañosPúblicos. Sounds fun, right? Remember a tweet that starts with RT actually came from the person after those letters (they stand for ReTweet) and so you should use that name. Choose something you know will be fairly comprehensible but challenging, something that doesn’t include questionable material (there’s a whole lot of raunch on Twitter), and a tweet that will spark conversation among students. 2. 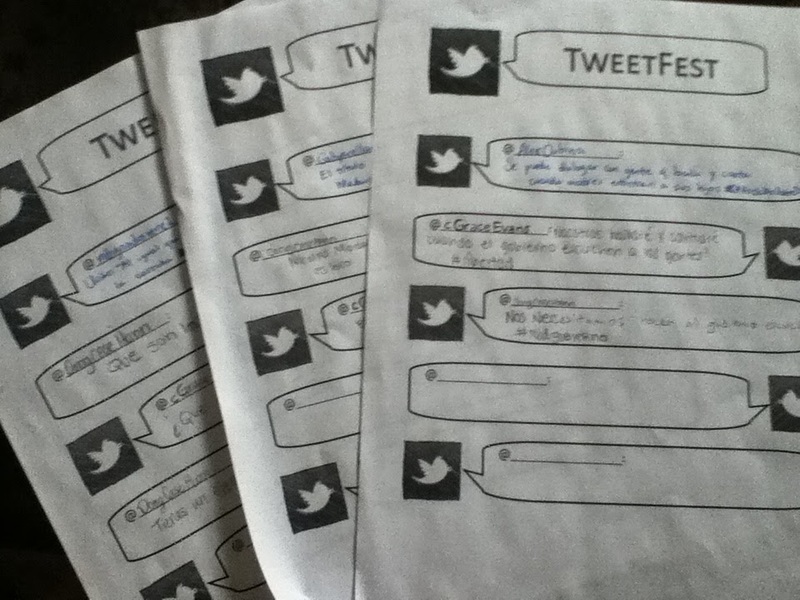 Distribute TweetFest papers and start a timer. Choose whether students will work in groups or alone. Working with a partner will add interpersonal conversation to the activity, but having students work alone will keep classroom noise down. Give students a reasonable amount of time to read and comprehend the tweet and compose a reply in the box underneath. I began with 3 minutes but this was not enough for my intermediate low readers to comprehend authentic tweets about the Venezuela protests and political crisis. 5 minutes was more appropriate. 3. Pass the papers and add some time. Have students, pairs, or groups exchange the TweetFest papers. Add a couple of minutes to your timer because now the students have to read and understand 2 tweets instead of one. If they don’t understand their classmates’ tweets, allow them to talk about it – negotiation of meaning is a critical skill. Have fun with an activity that unites authentic resources, culture, social media, and interpersonal communication. You can download the TweetFest activity for free on my resources page. I like this idea! So each student started with a different authentic text? And then had to comment on it? And then the next student just had to make a different comment? Or were they making up a fictional reply from the source? Yes, each one started with a different authentic tweet. Then they made up their own reply and passed it to the next person. So the next person would read the original, and the reply, and then formulate his/her own reply. Enjoy!